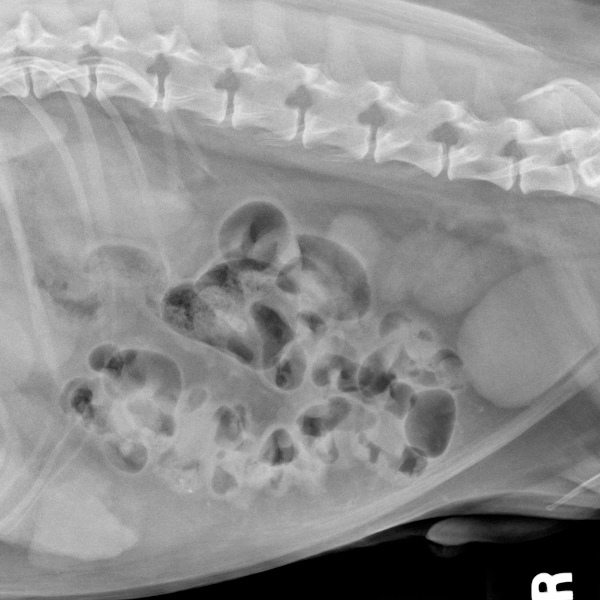 Coby Richter, DVM, DACVS, describes a case of esophageal perforation from a stick injury in a dog. Initial patient management, endoscopic evaluation, surgical correction, and post-operative care are covered. 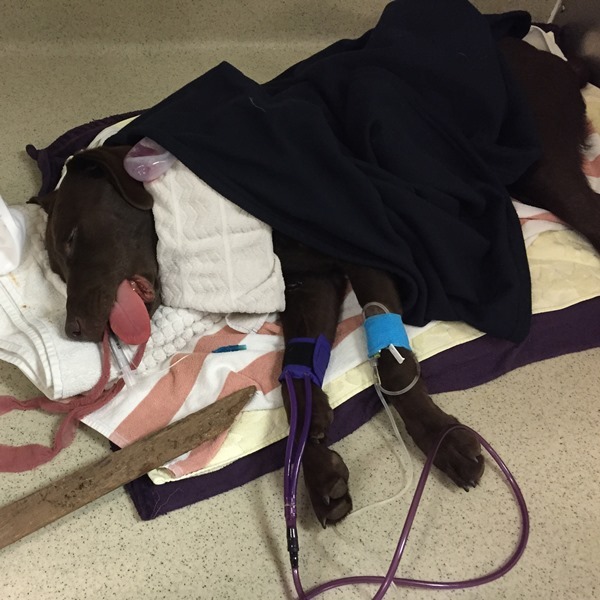 An 11 month old Labrador retriever presented on emergency after sustaining a stick impalement injury. During a game of fetch, the young dog dove for the stick inadvertently shoving one end deep into the back of his oropharynx. Following stick removal, he appeared painful, was drooling (normal appearing saliva) and had a dry cough prompting a visit to DoveLewis. On presentation the dog was quiet, with a normal temperature (100.6 F) and respiratory rate and pattern. He was tachycardic (HR 120 bpm) and systolic blood pressure of 130mmHg. No ocular or nasal discharge was noted and he was no longer drooling. Subcutaneous emphysema was palpable in the cranial cervical region. The dog was given oxymorphone (0.07 mg/kg IV) and an intravenous catheter placed in anticipation of anesthesia. An extended data base was unremarkable and he was started on ampicillin/sulbactam, maropitant and pantoprazole IV. Radiographs were obtained of his cervical and thoracic regions showing pneumomediastinum but no pneumothorax or other significant abnormalities. After discussion with the owner, the dog was anesthetized and moved to sternal recumbency for endoscopy. He was intubated routinely with no hemorrhage or injury noted in the oropharynx. A flexible videoendoscope was passed into the esophagus where a full thickness longitudinal perforation was documented (beginning at 25 cm from the left upper canine tooth and extending approximately 3 cm). Anticipating post-surgical care, the endoscope was passed into the stomach and a 20F percutaneous endoscopic gastrostomy tube (PEG tube) was placed in routine fashion. The endoscope was removed and the patient was prepped for surgery to repair the esophageal perforation. At surgery, a 2.5 cm dorsal esophageal tear was encountered. A culture of the deep tissues was collected. An oroesophageal tube was passed to aid in visualization and manipulation of the esophagus. After lavage and debridement, the perforation was closed in two layers (3-0 Maxon simple interrupted in the mucosa/submucosa followed by 3-0 Maxon simple continuous in the muscular and adventitial layer). A 10 F round Jackson-Pratt drain was placed between the esophagus and stylohyoid muscle prior to closure of more superficial tissue planes. Following skin closure, the videoendoscope was advanced again to examine the repair. No suture was visible in the lumen of the esophagus and the perforation appeared completely sealed during dilation. The dog remained hospitalized for three days following surgery. The JP drain produced on average 2.5 ml/hour or less of serosanguinous discharge and was removed immediately prior to discharge. PEG tube feedings began 24 hours after surgery and were uncomplicated. The initial wound culture (collected at surgery) grew an Escherichia coli and Stenotrophomonas maltophilia and the dog was maintained on amoxicillin/clavulanate for two weeks post discharge. At six days post discharge, he re-presented after having partially consumed his PEG tube. A new PEG tube was placed endoscopically through the same stoma, and during this procedure the esophageal repair site was evaluated. The repair was intact and maintained a seal during examination and dilation. The PEG tube was removed 18 days after initial injury at which time the dog was doing well and was on all oral medication and feedings. He has experienced no complications since that time. Surgical repair of esophageal perforation has a higher complication rate (dehiscence, local infection, fistula and stricture) than repair of other portions of the intestinal tract. Factors that impede success include contamination with foreign material, motion (during swallowing and neck movement), lack of serosa and segmental blood supply. Contamination is best dealt with by early surgical intervention and thorough lavage and culture of the deep wound. Motion at the site can be minimized (but not eliminated) by use of a gastrostomy tube and use of a neck/head harness to restrict extension. Meticulous dissection and anatomic identification during surgery to preserve existing vascular supply, coupled with control of inflammation (NSAIDs, dead space elimination, bandaging, warm/cool compressing etc.) are important to maintain tissue viability. A 2008 retrospective reported a mortality rate of 36% (5/14) in dogs with acute esophageal stick penetration. As with most surgical cases, early repair carries the best prognosis. This patient was in the surgical suite less than a few hours after perforation. Copious lavage at surgery and providing a mechanism for the removal of wound fluid are keys to a successful repair. In this case, the perforation was located dorsally in the esophagus which meant that dead space and potential pocketing was several tissue planes from the skin. Penrose drains may have been employed but a closed suction system is preferred for several reasons in this location. First, it allows for measurement and analysis of fluid. This enables the clinician to make an educated decision about when to remove a drain. Secondly, motion and compression of the muscles and tissue planes superficial to the repair will not impact the effectiveness of the drain. Finally, Penrose drains not only let fluid out but are a potential ingress for bacteria which could complicate healing further. Placement of a PEG tube in this dog allowed immediate feeding while bypassing the repair site. All medications were able to be transitioned to oral forms quickly (which can be given via the PEG tube). Owner compliance with medications which can be given via the PEG tube tends to be very good (higher than with multiple oral medications). The PEG tube also allows a gentle transition back to oral feeding. Gastrostomy tubes are usually maintained at least 10 days post-placement to allow an adhesion to form between the body wall and the stomach. Doran IP, et al: Acute oropharyngeal and esophageal stick injury in forty-one dogs. Vet Surg 37:781, 2008. Kyles AE: Esophagus. In Tobias and Johnston editors: Veterinary Surgery Small Animal. 2012 St. Louis, Elsevier.